I thought I'd create a thread for all the tiny bugs one finds that are not worth a whole thread of their own. I noticed that there don't seem to be that many different names. Right now I have a family needing a room, but the person requesting it has no unique name. Would be nice to have a larger name pool so that doesn't happen. 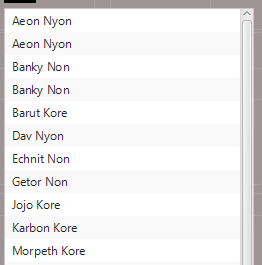 And in case it still happens (which is likely if the names are chosen randomly^^) it would be nice to see more information about the requester in the request window, so that you can better see which person it is. Adding numbers could help with that. Or adding the option to show the ID of a person. I don't really see it at all here in Germany. I think it's more popular in the US anyway. Also: The different factions in the game could handle names differently. I don't know if that is already the case, but if not it would be a nice feature I think. Good find here, man. The quantity should be 125, as you have deduced. That was logged in ticket #393 and a fix should be in place in the next release. Also, Torvus is right with the how the naming is working now. 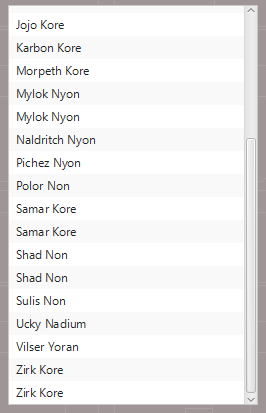 Some NPCs (depending on their personalities) like to name their children after themselves, but it's getting out of control / in the way of gameplay. I've logged a feature request in ticket #394 to drastically reduce this. Well, the main problem with that right now is that you have no indication which person is requesting a room if there are several with the same name. Simply reducing that wouldn't really solve that problem. I think adding a count to those names would help a lot. Or you could add a remark in the list when choosing who to give a room to. Something like "John Doe (requested a room)", or maybe something shorter, like "req.". Also a remark for those that already have a room assigned. Asgarus wrote: Or you could add a remark in the list when choosing who to give a room to. Something like "John Doe (requested a room)", or maybe something shorter, like "req.". Utterly brilliant. This is a really quick fix I can jam into the patch coming out this weekend that'll solve the room assignment problem in the short term, and I'll come up with a mechanism to decrease the same-naming issue thereafter. Between you and Torvus, you guys have the sharpest insight with suggesting these kinds of fixes. You two should seriously work in QA for software.